Amateur radio enthusiast and blogger 9A4QV has released a new wideband low noise amplifier (LNA) circuit that would work well with the rtl-sdr. It amplifies from 28MHz to 2500MHz with a 1dB noise figure. Check it out on his page here. At 20 Euros plus 5 Euros worldwide shipping for a fully assembled LNA, it is quite a good deal. This small gadget can lower and improve you DVB-T SDR stick noise figure and improve the sensitivity. Adding the LNA in front the front end of your receiver can open another dimension in your reception. Receiving HAM radio satellites should not be a problem even with the small setup and portable antennas. 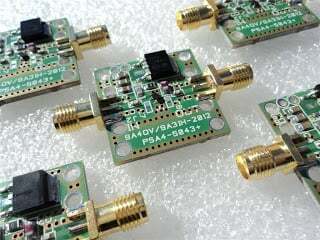 LNA For All – Wideband Low Noise Amplifier for the 88-108 mhz. Do you hav ethis product. How must does it cost to ship it to Mauritius. Thank you. Hi, has anybody tried to use this LNA for amateur radio astronomy projects (at 1.4 GHz)? How can i order for iT????? ?